Spending my hard earned . . . Thanks gents, you have put my mind at rest somewhat. The welding table is actually a bonafide one it comes with the bricks for gas welding/brazing and there is a steel plate underneath for electric. It looks like an older model as flamefast doesn't list it on their site. Hi all I decided to bite the bullet and buy some kit. I managed to find a very nice swage block with stand and a load of tools nearby on ebay, the seller also had a professional welding bench so I decided to get that too. These all came from a school and apart from some surface rust on the tools they are like new. All tolled I paid £400 is this good? Thanks for the input. I have been given a t/d blower but I have not seen it yet so cant say if it will be suitable or not yet. I was just wondering if anyone had used one before. My hobby forge set up has 1 1/4" inlet pipes with 8 10mm holes as the blast. In the pic I am using charcoal and the air is coming from the bellows (easy to control the air flow) I have already made up a slide valve for the inlet ready for the electric blower, once I have that I will be burning coke. Well I picked up the bellows on sunday evening, there is no makers name on them anywhere unfortunately. They shift a fair amount of air so the valves work.The leather seems to be ok but I will condition it to make it more supple. 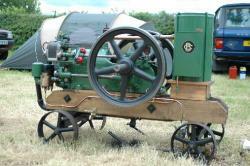 The plan is to have it driven by a vintage stationary engine via a reduction box, I think it should have enough 'puff' to run two small forges for demo purposes but time will tell im sure. Hi all I came across this on ebay and it was close and a real bargain. I go and pick it up on sunday so I will be able to have a closer look. It looks like it might be an Allldays and Onions but i'm not sure, maybe someone will be able to confirm that? I plan to have a go at making a split feather from an old butter knife as a gift for a friend. Hi all, I decided to have a crack at making a Bass fish from 1.5mm alu sheet. This was my first attempt at a fish of any kind, I may have a buyer for it already and they also want a full size salmon too. What do we think? They are arc welded on and filed back to near flush. Here's the toasting forks I've been working on this week. I also made some copper roses, you could wrap the stem round a glass to create a vase. Hi all, I managed to find an anvil today. I was told about there was one sitting in someone's car port on the other side of the town (about a mile away). I did a reccy and there was a man in the garden so I asked him if it was for sale, he seemed a bit defensive at first but after I told him I was a trainee blacksmith his mood changed and he said yes he'd sell it. We agreed on a price and it was mine. I gave it a spell with the wire brush and gave it a lick of paint, it has part of one foot missing but that shouldn't matter, I think it's around 35kgs. What do we all think? Thanks for the kind words gent's. I'm really enjoying the work so far.